Your home and your things are very ‘you’. That’s why we look after them with cover for events like fire, burglary and flooding. Whether you choose comprehensive premium cover or our great value basic cover, you can trust us to look after your building and contents. This table is a summary of significant features and benefits only. Please refer to the HBF Accidental Damage Home Insurance, HBF Listed Events Home Insurance and HBF Fundamentals Home Insurance Product Disclosure Statements (PDS) and policies for full terms and conditions. If you’d like to talk to someone about your home insurance needs, call 133 423 or visit your local branch. What does building and contents insurance cover? HBF building and contents insurance provides extensive cover for your home, household goods and personal belongings against events like flood, fire, earthquake, theft, burglary and storm damage. fences and gates (limits may apply). Everything else for your building is covered, up to the sum insured as listed on your policy schedule, apart from the specific items listed under “what isn’t covered by building insurance” which you can find in the PDS. Remember, there are set maximum amounts that we’ll pay when you make a claim. These are included in your building and contents sum insured amount, which is listed in your policy schedule. What is not included in my cover? We will cover household goods or personal effects that are not fitted or fixed to buildings (this comes under your building insurance then), that you own or are legally responsible for. There are set maximum amounts that we will pay when you make a claim, and these are included in the contents sum insured amount. HBF Accidental Damage insurance provides premium cover for your home and contents for any accidental damage or loss from unintentional or unforeseen events, such as theft, fire, explosion, landslide, storm or flooding. It also covers any accidental breakage of things like windows, glass, mirrors and sinks. Debris removal and demolishing; we will cover the reasonable costs to demolish and remove any debris that results from loss or damage to your buildings or contents, up to 10% of your building or contents sum insured (in addition to the sum insured). What’s optional special valuables cover? With Special Valuables insurance you can nominate an amount for your special valuable, and we’ll cover it for accidental loss or damage anywhere in the world for up to 90 consecutive days. Unlike Accidental Damage insurance, Personal Valuables insurance covers the full amount of your insured item. That means if you insure a diamond ring for $8000 and then accidentally lose it, we will cover it for the full $8000 amount. Under an Accidental damage policy the most we will pay for this item is a maximum of $2500. I own items that are valuable and that I take away from the home. Are these items covered? It depends on which policy you have. With Accidental Damage policy, your valuable items are covered away from home – up to 20% of your sum insured, or up to $7,500 in total per claim, with an item limit of $2,500. With a Listed Events policy or Fundamentals policy, valuable items are not automatically covered outside of your home. If you have an item worth more than $2,500 that you take away from home, you can add an optional Special Valuables cover to your policy to make sure that the item is covered to its full value. When choosing an amount of cover for your home, make sure to think about what it will cost to completely rebuild your home, not just the resale value. An easy way to get an accurate estimate of the value of your home is to use our building calculator. Alternatively, you can use this common method of estimating, which considers things that can increase building costs. What would be the cost of rebuilding your house today, rather than when you originally built the home? What materials are used in the building and its finishes? How many levels are there? Is there a verandah? What are the costs of council approval on plans and other fees? Check if your policy covers demolition, debris removal, levelling or landscaping – because many don’t and you would have to pay extra. When choosing an amount of cover for your contents, think about how much it would cost to replace each item, not what they’re currently worth. Our contents calculator is an easy way to work out the right level of cover for your contents. If you need to make emergency repairs to your house, let us know and we’ll organise one of our repairers to help you as soon as possible. Contact us on 1300 559 867 to lodge a claim and we will arrange these repairs for you. 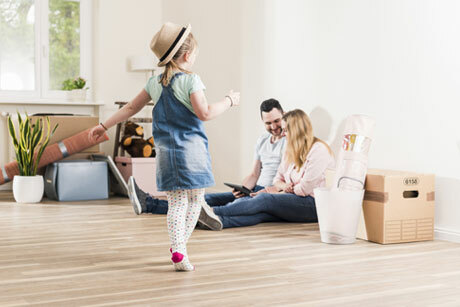 I am moving house – do I need to take out two insurance policies to cover both addresses? This cover will stop immediately if the sale contract is terminated, or your building insurance policy ends. Don’t forget, you will need to take out a separate policy for your new home. I'm about to renovate my house – does home insurance cover renovations? If you’re about to start a renovation, you need to let us know as the cover provided under your policy may change. During your renovation, we will not cover any damage caused by water entering the building through an opening made for any renovation or repair work. Also, we will not cover any structural defect, faulty design or faulty workmanship from when your home was first constructed or when it is being renovated. I am going on holiday for 4 weeks – do I need to notify HBF? If you’re leaving your house unoccupied for a continuous period of 60 days or more, it’s a good idea to let us know, as there may be changes and special conditions which we may need to apply to your policy. Our Landlord insurance helps to protect your investment property and contents, along with an option to protect your rental income – for added peace of mind. Insurance issued by Insurance Australia Limited ABN 11 000 016 722 AFSL 227681 (IAL), trading as CGU Insurance. For full policy details please refer to the Fundamentals Product Disclosure Statement (PDS), Listed Events Product Disclosure Statement (PDS), Accidental Damage Product Disclosure Statement (PDS) and Landlords Insurance Statement (PDS) which can be obtained by calling HBF on 133 423. This is general advice only and does not take into account your personal circumstances. You should consider the PDS and your personal circumstances in deciding whether to buy or hold these products. HBF Health Limited ABN 11 126 884 786 AR No. 406073 (HBF Health), is an authorised representative of IAL. Please read the Financial Services Guide (FSG) before applying for an HBF General Insurance product.